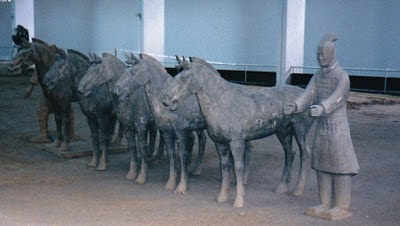 There are 8,000 plus terracotta warriors, chariots, horses, civil servants and officers buried with Emperor Qin in Xian. Since 1974, archaelogists, historians, clay artisans, administrators, pit diggers have only managed to piece together approximately 700+ of these life sized clay figurines. Tediously piecing together the gazillion bits of artifacts has its benefits in the form of lifetime job security. 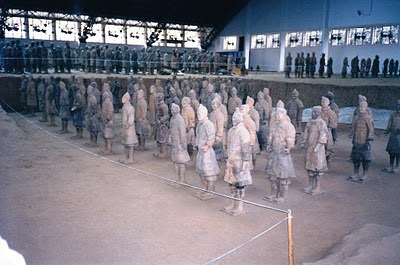 The site of the mausoleum of the first Qin Emperor is a Unesco World Heritage comprised of 3 main pits, and museums. The two football sized main museum houses the Mausoleum of Emperor Qin and his army and chariots. 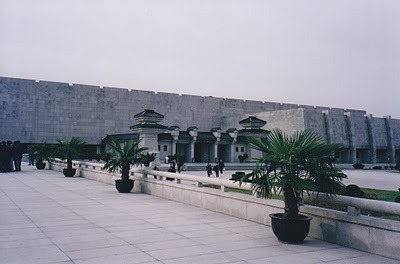 The other museums contain the civil servants and the command centre of the armed forces. There are other pits that were still closed to the public when I visited in November 2003. 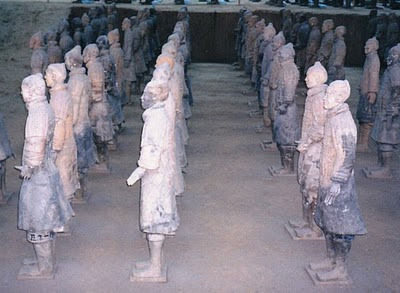 Emperor Qin lived and reigned between 257-209 BC. In his lifetime, he unified the different kingdoms in China, and among other things, erected the first version of the Great Wall. 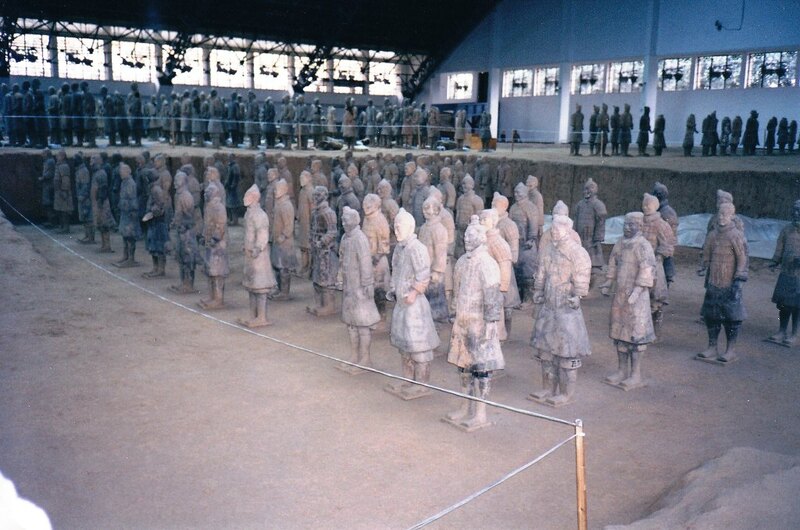 To modern day visitors, 2200 years later, he will always be known only for his life sized army and the surrounding complex of clay. 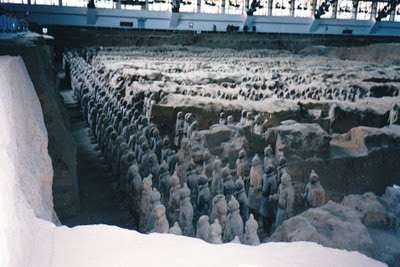 One good feeling can take away from visiting this humongous cemetery of antiquity, Emperor Qin provided jobs for 700,000 workers and artisans. 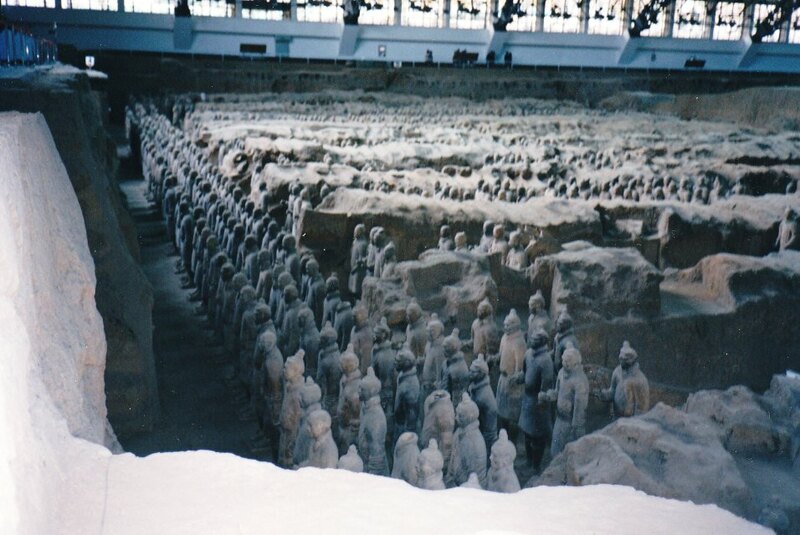 Instead of taking real people (slaves, virgin maidens, concubines etc) as companions into his after life, he opted to go with an army of clay soldiers. It's a marvel that they didn't turn to dust.